Sugar, starch (corn, pea, potato), modified corn starch, whole EGG powder (1.5%), gelling agent (carrageenan), turmeric, natural paprika extract, flavourings.May contain gluten, milk, soy and nuts. Creme Brulee Preparation Instructions: Based on 1 box (1250g) made with 5 litres of milk and 5 litres of cream. 1) Bring the milk (whole or semi-skimmed) and cream (whipping or double cream) to the boil. 2) Remove off the heat and whisk in the powder until it is fully dissolved. 3) Pour the mix into ramekins and refrigerate for 3 hours.4) Before serving, sprinkle with sugar and caramelize using a blow torch. (Note sugar is not provided). 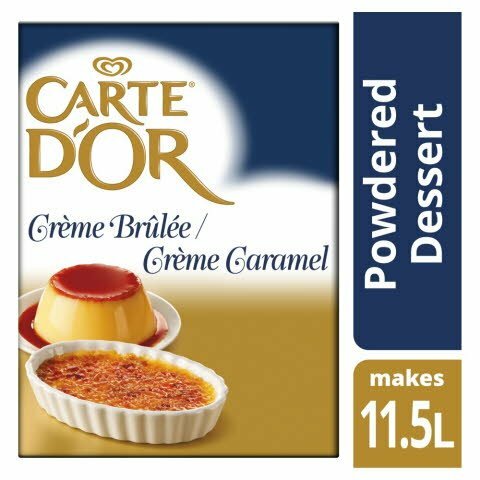 Creme Caramel Preparation Instructions: Based on 1 box (1250g) for 10 litres milk. 1) Bring the milk (whole or semi-skimmed) to the boil. 2) Remove from the heat and whisk in the powder until it is fully dissolved. 3) Make a caramel then pour into the base of the ramekins and allow to cool. (Note caramel is not provided) Pour the mix into ramekins and refrigerate for 3 hours before serving.